The MAC is headquartered in the Public Square district in downtown Cleveland, Ohio, and has two members in the nearby Akron area. The MAC has been referred to as the "Conference of Quarterbacks" because of the accomplishments of numerous former players in the National Football League. The conference also ranks highest among all eleven NCAA Division I FBS conferences for graduation rates. The membership was steady for the next two decades except for the addition of Marshall University in 1954 and the departure of Western Reserve in 1955. Marshall was expelled from the conference in 1969 due to NCAA violations. 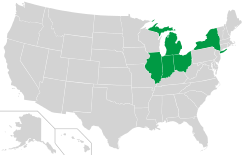 The first major expansion since the 1950s took place in the mid-1970s with the addition of Central Michigan University and Eastern Michigan University in 1972 and Ball State University and Northern Illinois University in 1973. NIU left after the 1985–86 season. The University of Akron joined the conference in 1992. 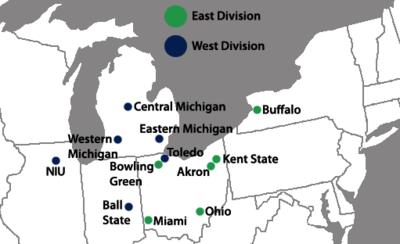 The conference became the largest in Division I-A with the re-admittance of Marshall and NIU and addition of the State University of New York at Buffalo's Bulls in 1997 and 1998, respectively. The University of Central Florida joined for football only in 2002, becoming the first football-only member in conference history. Marshall (a second time) and Central Florida (a non-football all-sports member in the Atlantic Sun Conference at the time) would leave after the 2004–05 academic year, both joining Conference USA in all sports. 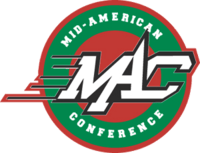 The Missouri State Bears, Evansville Purple Aces, and Southern Illinois Salukis participate in the MAC for men's swimming and diving. In 2012, the West Virginia Mountaineers joined the Florida Atlantic Owls and Hartwick College Hawks as men's soccer affiliates. Missouri, Northern Iowa, and Old Dominion are wrestling affiliates. The Missouri State Bears are also an affiliate for field hockey. The 2014–15 school year saw one affiliate member leave for another conference and two new affiliates join. The Hartwick men's soccer team left the MAC for the Sun Belt Conference, which had announced in February 2014 that it would reinstate men's soccer, a sport that it last sponsored in 1995, for the 2014 season. The new affiliates for 2014–15 are Binghamton in men's tennis and Longwood in field hockey. † = On March 26, 2014, UMass announced that they would leave the MAC following the 2015 FBS football season. Nicknames listed here reflect those used during each school's MAC tenure. Two schools have changed their nicknames since leaving the MAC—Central Florida dropped "Golden" from its nickname, becoming simply Knights, while Wayne State now uses Warriors. Western Reserve merged with Case Institute of Technology in 1967 to form today's Case Western Reserve University, with the athletic programs merging in 1971. With the athletic merger, Case Western abandoned the nicknames of both former institutions and adopted Spartans. ‡ = In early 2014, the MAC made the decision "... to move forward without multi-divisional institutions." The conference then informed Hartwick College that their contract as an affiliate member would not be renewed. The Mid-American Conference sponsors championship competition in 11 men's and 12 women's NCAA sanctioned sports. As of the 2014–15 school year, 10 schools are associate members for six sports. ↑ Affiliate member West Virginia. ↑ Affiliate members Evansville, Missouri State, and Southern Illinois. ↑ Affiliates Missouri, Northern Iowa, and Old Dominion. ↑ Affiliate members Longwood and Missouri State; Appalachian State will become an affiliate in 2017. ↑ Rifle is technically a men's sport, but men's, women's, and coed teams all compete against each other. Akron fields a coed team. ↑ Synchronized skating is sanctioned by U.S. Figure Skating, not by the NCAA. Most synchronized skating teams are clubs not affiliated with any college or university; Miami is one of about 15 schools that sponsor varsity or club teams. For the current season, see 2016 Mid-American Conference football season. In 2016, the MAC is contracted to provide a team for five college football bowl games: the Miami Beach Bowl, Bahamas Bowl, GoDaddy Bowl, Famous Idaho Potato Bowl, and Camellia Bowl. The MAC also has secondary agreements with the Poinsettia Bowl and with several ESPN owned bowls. The MAC Champion (if not invited to the College Football Playoff or its associated bowls) is not contractually obligated to any specific bowl. The Conference and the Universities select which teams will play in which of the league's five affiliated bowls. The following are the most recent champions of each sport's respective conference tournament. Champions from the previous academic year are indicated in italics. A number of MAC sports, including football, men's and women's basketball, baseball, soccer, wrestling and volleyball, are telecast on Time Warner Cable Sports Channel (Ohio) replacing SportsTime Ohio and Fox Sports Ohio as the MAC TV Partner. The deal was signed in August 2013 and is for five years. Along with TWC SportsChannel, ESPN Regional TV retains the "local and regional" syndication telecast rights to the MAC for Football. Ball State produces its own comprehensive television package with Ball State Sports Link. Affiliate stations include WIPB in Muncie, WNDY in Indianapolis, The CW in Fort Wayne, WHME in South Bend, WTVW in Evansville, WYIN in Merrillville and Comcast in Michigan. All Ball State Sports Link games are also broadcast on student radio station WCRD and on the Ball State Radio Network produced by WLBC-FM and Backyard Broadcasting. ↑ "International Bowl 2008". 2007. Retrieved January 20, 2012. ↑ Alexander, Elton (February 4, 2009). "Mid-American Conference riding Steelers' wave of MAC stars into high-school recruiting battle". The Plain Dealer. Retrieved January 20, 2012. ↑ "MAC Football Programs Lead I-A Public Institutions In Graduation Success Rates" (Press release). MAC-Sports.com. September 8, 2006. Retrieved September 25, 2009. ↑ "Volume high, but conference movement itself not unprecedented". NCAA. Retrieved December 15, 2012. ↑ Wilson, Tracy. "The Real Story Behind We Are Marshall". Retrieved November 8, 2011. ↑ "Missouri State Will Join Mid-American Conference in Men's Swimming". Missouri State University. 2009. Retrieved July 7, 2012. ↑ Carvelli, Michael (April 3, 2012). "West Virginia men's soccer team to join the Mid-American Conference next season". The Daily Athenaeum. Retrieved July 7, 2012. ↑ Elton Alexander (April 19, 2011). "University of Massachusetts football to join Mid-American Conference, sources say". The Plain Dealer. Retrieved April 19, 2011. ↑ UMass Football Will Leave Mid-American Conference at End of 2015 - University of Massachusetts Official Athletic Site. Umassathletics.com (2014-03-26). Retrieved on 2014-04-12. 1 2 3 4 5 6 7 8 9 10 11 12 "This is the mid-american conference". Retrieved May 5, 2012. ↑ Armon, Rick (September 19, 2015). "University of Akron squeezed by building boom, falling enrollment and flat state revenue". Akron Beacon Journal. Retrieved September 23, 2015. 1 2 "The Blade". The Blade. January 2010. Retrieved June 15, 2010. ↑ "Fifteenth Day Enrollment Statistics". Student Enrollment Data. Kent State University. September 15, 2015. Retrieved September 17, 2015. ↑ "Identification and Standards Manual" (PDF). Miami University. May 2014. Retrieved 2014-09-12. ↑ "Graphic Identity System: Logos and Standards" (PDF). Eastern Michigan University. Retrieved 2014-09-12. ↑ NIU Athletic Marks Standards Guide (PDF). Northern Illinois University. 2015-07-01. Retrieved 2015-10-18. ↑ "MAC Adds Three Affiliate Members In Wrestling" (Press release). Mid-American Conference. August 29, 2012. Retrieved September 21, 2012. ↑ "Sun Belt Men's Soccer to Re-Debut in Fall 2014" (Press release). Sun Belt Conference. February 11, 2014. Retrieved February 13, 2014. ↑ "Binghamton Joins in Men's Tennis and Longwood in Field Hockey" (Press release). Mid-American Conference. April 21, 2014. Retrieved June 13, 2014. ↑ "UMass football program leaving MAC after 2015 season". CBS Sports. Retrieved March 26, 2014. 1 2 3 4 "Year-By-Year Standings" (PDF). 2013 MAC Men's Soccer Media Guide. Mid-American Conference. pp. 25–26. Retrieved July 8, 2014. 1 2 "MAC Men's Tennis Tournament History" (PDF). 2012 MAC Men's Tennis Record Book. Mid-American Conference. Retrieved April 22, 2013. ↑ "Annual MAC Standings" (PDF). 2012 MAC Field Hockey Record Book. Mid-American Conference. Retrieved April 23, 2013. ↑ "MAC > Home". Mac-sports.com. Retrieved June 30, 2013. ↑ "Mid-American Conference and Quicken Loans Arena Announce Extension to Hold FirstEnergy Mac Tournament at The Q Through 2017". Quicken Loans Arena. 2010. Retrieved March 14, 2011. ↑ "MAC Tournament History" (PDF). 2008-09 Men's Basketball Media Guide. Mid-American Conference. 2008. pp. 62–63. Retrieved September 26, 2009. ↑ "Scheumann Stadium". Ball State University. Retrieved June 26, 2016. The most recent renovation transformed the stadium into a major community asset, while increased its capacity to 22,500 and added permanent lighting for night games. 1 2 "MAC Hall of Fame". Mid-American Conference. Archived from the original on July 14, 2011. Retrieved January 26, 2009. ↑ "MAC Announces 2012 Hall of Fame Class". Mid-American Conference. Retrieved May 10, 2012. ↑ "MAC Announces 2013 Hall of Fame Class". Mid-American Conference. May 30, 2013. Retrieved May 30, 2013.